Your place is not confirmed until you have either paid in full or paid 1 x instalment fee of £220. Balance is due no later than 2 weeks prior to the course, failure to pay on time could result in your place being released and resold. No reminder will be sent. Received payments are non-refundable (except in the unlikely event that the course is cancelled). Should you wish to transfer to another date you can do so for a penalty charge of £95 (in addition to the deposit paid) up to 2 weeks before the course. Postponements received after this date are charged at £180. Cancellations received prior to 8 weeks will receive a refund less the deposit. Cancellations received after 8 weeks are non refundable. You will receive an electronic receipt once your have paid, this confirms your place. Then 2 weeks before the course a full schedule and instructions will be emailed to you. Course material remains the copyright of Bernadette Chapman and cannot be copied or transferred to another individual or company. Failure to submit assignments within the agreed time scale could result in the assignments being unmarked. Do you work in the wedding industry? Have you undertaken any prior training? 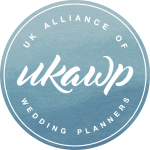 Where did you find out about the UKAWP?